When it comes to all things audio, Electro-Voice has consistently been an innovator - from their earliest radio receivers and custom-built PA systems to the development of their microphones, amplifiers, and loudspeakers. Today, almost ninety years later, passion for incredible audio remains the driving force behind Electro-Voice. Continuing to design, research, and build the newest, most efficient products in the industry, a piece of Electro-Voice gear is always ready for whatever live sound application awaits. 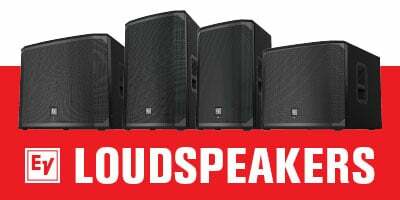 All you need to do is look to all of the touring musicians using their versatile microphones and portable PA setups, club owners running a fixed high-performance EV sound system, and large venues trusting EV to deliver an incredible audio experience. 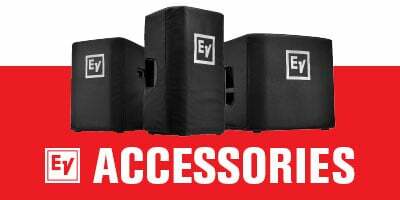 Simply put, EV loudspeakers are the preferred choice of countless musicians, proprietors, and engineers throughout the world. The year 2017 marks the 90th anniversary of Electro-Voice. In celebration, American Musical Supply is proud to bring special recognition to their ongoing and extended relationship with this iconic American brand. From Electro-Voice microphones to Electro-Voice powered speakers, it is easy to see the individual milestones when looking back at nearly a century of innovation and audio excellence; the RE-20 Variable-D™ microphone, Compound Diffraction and Constant Directivity horn designs, EV-1 Eliminators, the Humbucking Coil, Neodymium magnet use, Sentry 100 active monitors, Ring-Mode Decoupling, Manifold Technology … the list goes on and on. But Electro-Voice is more than all that. For Electro-Voice remains an American company, with a history deeply entwined in the American experience. American Musical Supply and Electro-Voice enjoy a shared existence on many levels. EV Marketing Manager for Portable Audio Mike Doucot explains further, “Our main offices and the AMS call center are both located in the upper Midwest. We share a lot of snow. But more importantly, the AMS staff is extremely knowledgeable and is able to service the Electro-Voice customer with confidence. 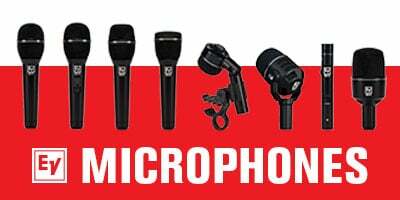 The staff at American Musical Supply also collects valuable feedback from the end users that they can then share with us, allowing us to look for ways to improve our product based on real-world experience.” From the AMS point of view, Electro-Voice is a legacy brand delivering an incredible value and stand-out reliability. As with so many hi-tech success stories, Electro Voice also begins in a tiny shop with a big idea. In this case, the idea was to make a better and more affordable microphone. So in 1927, with a drill press and a milling lathe, Al Kahn and Lou Burroughs set up shop in South Bend, Indiana and expanded from PA system installations to microphone manufacturing. South Bend, Indiana was smack in the middle of the Midwest manufacturing surge and already the home to Studebaker automobiles and Singer sewing machines. It is hard for us to imagine the American landscape when Electro-Voice was born. A scant two-thirds of American homes had electricity. World War I had ended less than a decade earlier, and the great depression was still a few years off. Radio was the medium of the day. Silent pictures gave way to “talkies” with The Jazz Singer in 1927 – the same year that Electro-Voice began. So EV was there at the beginning, installing theater and concert sound systems as soon as the need arose. With the advent of World War II, Electro-Voice developed the differential circuitry needed for a noise-cancelling microphone. In a spirited and patriotic move, Electro-Voice made the technology available at no charge, allowing other companies to manufacturer under these patents to assist the war effort. Ship crews and captains, pilots and gunners, tanks commanders and drivers, all benefitted from having clean, clear, intelligible communications while on the move or in battle – saving countless lives. In 1962, EV microphones reached new heights while accompanying American astronaut and statesman John Glenn on his historic flight orbiting the earth. While the war years, sports legends, and outer space adventures add spice to the story, they only tell part of the Electro-Voice saga. What really put Electro-Voice on the map was consumer audio consumption. While in London, founder Al Kahn visited Decca Records for a secret demonstration of the stereo phonograph record. On his return to the states, Kahn had his company tool up to create stereo phonograph cartridges. When stereo LPs did hit, Electro-Voice was ready. According to Kahn, “for six to eight months are sales department was walking on a cloud. All they had to do was allocate.” During this same time, Radio listening had grown to mammoth proportions, and television was on the upswing. Electro-Voice created the Model 664 microphone – affectionately known as the Buchanan Hammer – reflecting both the robust pressure-cast casing, and the company’s move to Buchanan, Michigan. The EV Model 664 was the first to use their Variable-D technology, eliminating the proximity effect that had plagued cardioid microphones, and ensuring even response at an equal distance. The Electro-Voice 642 Cardiline shotgun microphone was awarded an Oscar in 1963 for its ability to capture dialog at a distance, while remaining out of sight from the cameras. It was the first audio product to receive an Academy Award. By 1970, Electro-Voice had introduced the RE20, perhaps their most famous microphone to date. 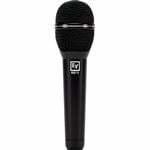 The Electro-Voice RE20 Variable-D™ mic revolutionized the broadcast booth and news production everywhere, and quickly found its way into major recording studios and sound stages. With their strong roots in Americana, Electro-Voice is nonetheless a major player on the international stage. Over a decade ago, EV became part of the BOSCH family. BOSCH is a privately held enterprise, immune to the demands of shareholders. This relationship provides Electro-Voice with access to the latest skills in manufacturing and world-wide distribution. Plus, all EV product made outside the USA is manufactured in a BOSCH owned facility, with the latest production tools and with rigorous quality control.